I consider our house to be a small space. We have around 1100 square feet of living area and it’s, by far, the smallest house we’ve ever lived in. I know that a lot of people live in much smaller spaces, but to us, this is small and it’s been quite a challenge for me to get used to. Even after living here for two years, I sometimes find it difficult to maximize storage and to find a balance between decorating using too much and not enough. 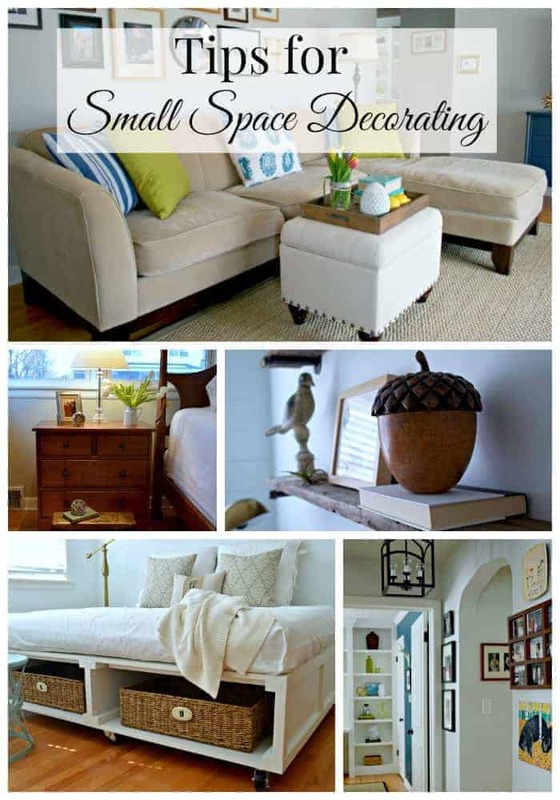 Here are some tips I’ve found helpful for the challenges of small space decorating. Mirrors. I know I’ve mentioned this before but mirrors really are a great way to open up a small space with added light. I have them all over my house and I feel like they do make a difference in making a small room seem more spacious. Multi-purpose furniture. Almost every piece of furniture that I have in my house is multi purpose. I really had to choose my pieces wisely and consider its storage capacity, its size in the space and surface area. I have very few surfaces to place decor and lamps, so I had to be very thoughtful with my choices. 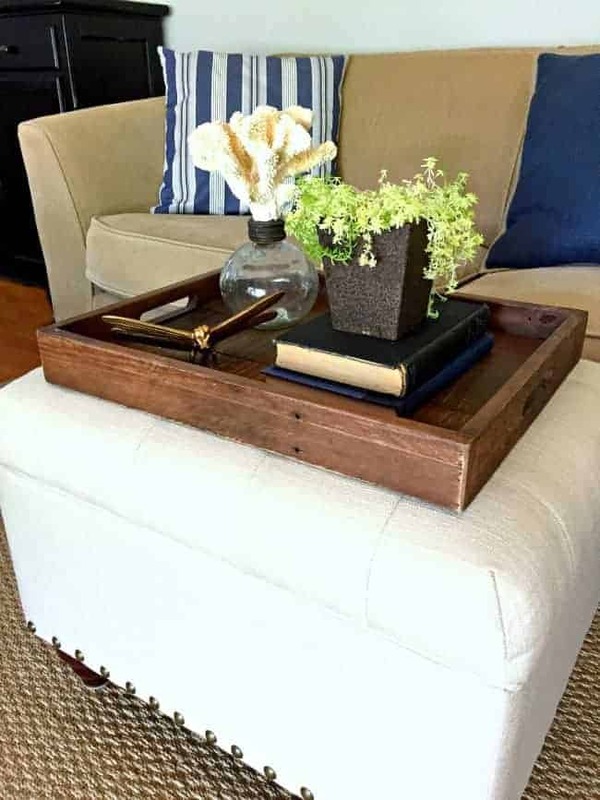 One example is my ottoman, which has storage for blankets and, with a tray on top, serves as a spot to place your drink or an area to place a few decorative pieces. Knick knacks. 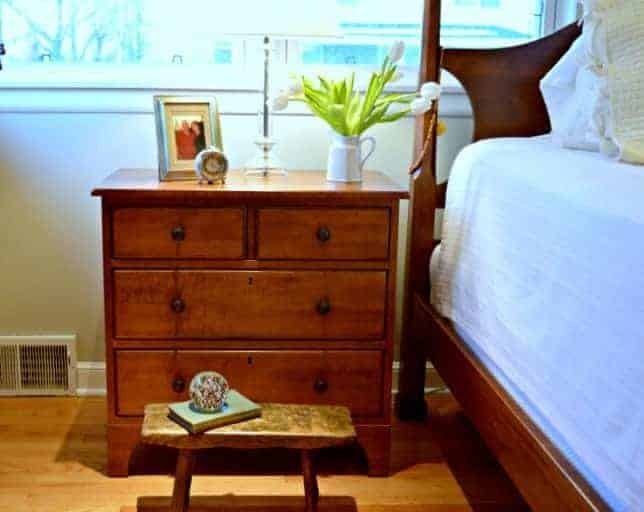 When you have a small space and limited area to place treasured decor, you don’t want to have tiny knick knacks taking up valuable real estate. I try to choose larger items and place them in groups of 3 or 5 and I often use a tray. It really adds a little extra to a grouping of items. Exposed legs on furniture. Most of my furniture has exposed legs and I think it makes a huge difference in our small space. Even in the bedroom, the legs on our bed are exposed and I don’t use bedskirts. Small is ok. This is by far the most difficult one for me. I read a lot of blogs every day and looking at big homes with lots of beautifully decorated rooms, when mine is small, is sometimes tough. I just have to remind myself that small is ok and that I need to make the best with what I have (then I remember how much work it is to clean a big house with 3 bathrooms and I feel better). 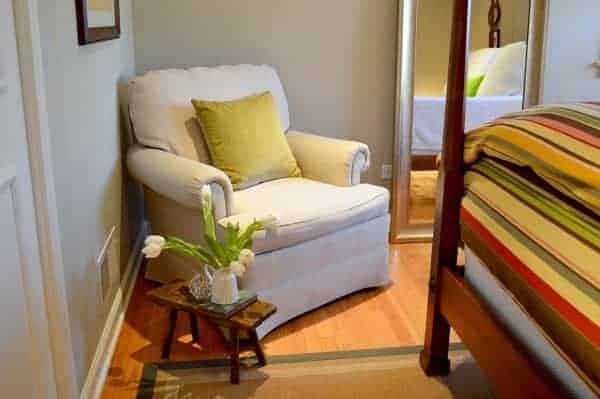 Have you ever been challenged decorating a small space? Any tips you care to share? I have found that hallway as a rule (in houses I have lived in) are dark. The hallway light is in the middle. If there is a line closet at the end of the hall it’s hard to see in there especially if I’m blocking the light. 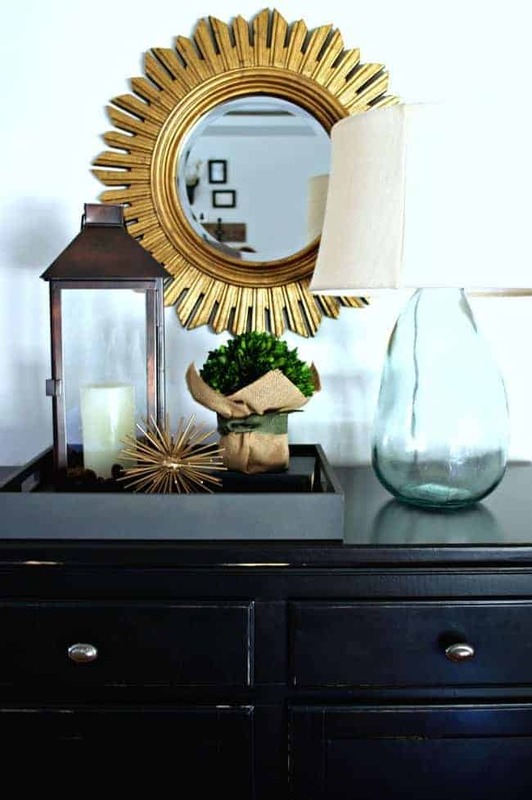 If there isn’t a closet a little console table with mirror above and a small lamp would look great. HOWEVER, I have never seen an outlet there to plug on in. Has anyone else noticed that? I find your simple decor soothing. I struggle with the wall clutter…all the family pictures and collages. 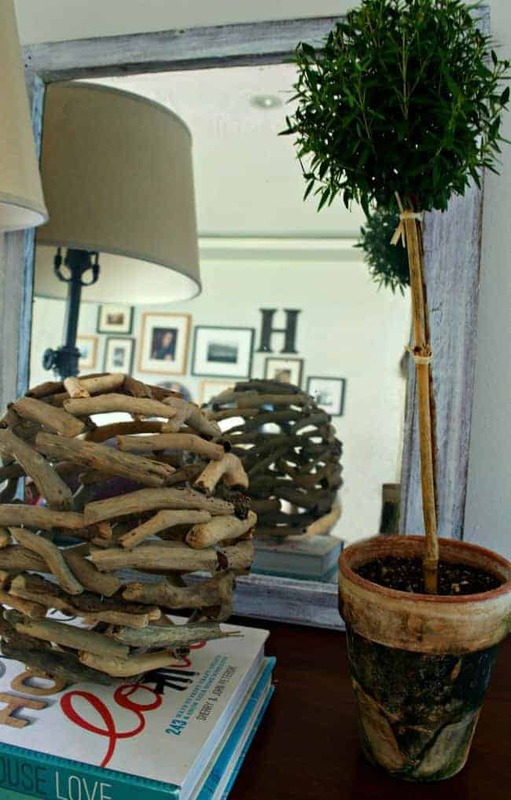 Mirrors are so versatile and can be used as an accent or statement piece. Love them. I consider my 1300 Sq ft home small and I am sure that stems from all the pins I see on Pinterest. So thank you for sharing your beautiful small home decor ideas. Thanks so much for your sweet comment Kelly. I agree with you about mirrors. You can use them anywhere. I appreciate your visit. Have a great weekend! I am with you on all the big houses, when some say small kitchen and see a BIG one. No idea what small means. So thank you, for knowledge about small. Awwww, thanks so much Katherine. I always love coming to your party…so much inspiration. Loved this post on The Shabby Nest Frugal Friday link party! What great ideas! Thanks so much and I appreciate you stopping in from Frugal Friday! My only tip is keep what you love and need and get rid of the rest. Getting rid of stuff you don’t love is a great tip Rue. I don’t usually do collections or anything like that but my husband saves everything. We seem to move often, so that is the only time he’ll purge. Thanks so much for visiting Rue! Mirrors are our best friend…I love them in large spaces, too. They bounce light all around and they are just pretty. Love them. I think you’ve done a good job on your small space. Hope you will come by to see me when you can. 🙂 I am linking to follow you. Thanks so much BJ. You are so right…mirrors are our best friend and they benefit all sizes of spaces. you have great ideas, Kristi. I’ve always loved mirrors, they really do bounce the light around and open up spaces. When we got ready to downsize we had to buy new sofas for the living room. It was difficult to find what I wanted and still stay smaller. Sofas can be monsters nowdays! Thanks Debra! Sofas can be monsters these days. I’m not sure what I will do when I need a new sofa. I see more and more people that live in small places getting furniture second-hand so I may have to go that route. Funny you should be talking about mirrors, I was perusing a local GW for some items for my Etsy shop and, ahem, my home too. I picked up a round mirror with a metal filigree frame (round too). I might paint the frame to look like brushed nickel. I thought my wall that is by my door to the garage would be a good place for it since that is where I walk out every morning and a quick check in the mirror would be nice. Hmm, this gives me an idea for maybe enlarging my hallway to the bedrooms and bath. It’s long and not very wide. I wonder if a large mirror would make it seem wider? It just might MJ. You have nothing to lose by trying it out right? I would love to hear how it works out for you, if you do give it a go. I think a mirror by your door is a great idea. I know that I use mine every time I walk out. Thanks so much for stopping in today. I always enjoy reading your comments. 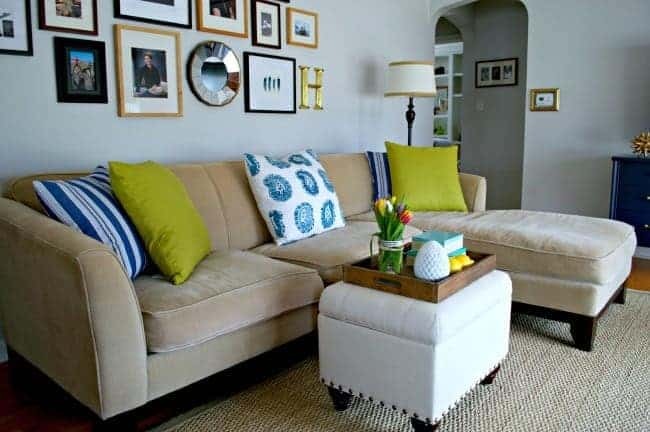 Like you I read a lot of blogs written by people with huge homes and budgets to match, so I really appreciate seeing smaller homes and great tips for decorating on a smaller scale. 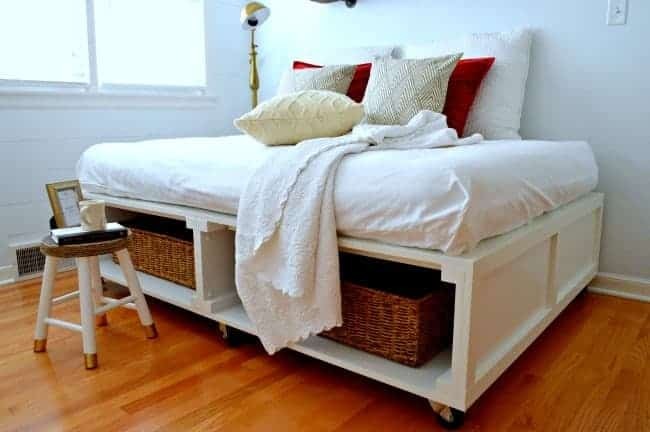 These tips can really be used in any size home. Your place is charming, and I love all of these tips. I have a rather long entry hall and I think a mirror is what I need. Thanks! I never thought, when we moved into our small home, that it would be such a challenge to decorate. I do agree with you,that these tips can be used in any size home. Hope a mirror is just what you need in your hallway. Thanks so much for stopping in today! I have found that less on the walls makes it feel more open. I read somewhere that you should leave at least one bare wall to give the eye a place to rest. I think that is true. My daughter has something on every wall in every room. I feel closed in and nervous there even though it is twice the size of my house. I never heard that tip before Debbie…thanks so much for sharing it. I think less is more too. I decorate very simply so I guess a small house is good for my decor style. Thanks for stopping in today and I hope the rest of your week is good. I always used to think the mirrors thing was something tricked upon people – that it worked, but only because you believed it worked. But, being in this apartment for about a month, I’m seeing it’s value. We have a vanity in the office (because the rest of the second bathroom is behind a pocket door – the whole thing is an add-on to the apartment that technically doesn’t belong!). Anyway, the mirror to the vanity is on my side of the room…and while it would be nice to have the floor space the vanity takes up, I don’t feel that there is a wall to my right nearly as much, because of the giant mirror above it! Also, giant mirror in our oddly small regular bathroom makes it seem not so tiny! Thanks Kim! I tend to go bigger with most of my furniture but I am using the same stuff I’ve had for 8+ years. I will probably go second hand if I have to replace anything.